The Big Apple recently outpaced Massachusetts' famed Route 128 in U.S. venture deals for the first time since 1999 -- leaving some to wonder what else New Yorkers are putting in their bagels. With 48 percent of the total venture capital pie, California remains the undisputed king of the American VC hill. But in the battle for second place, New York supplanted Boston in the third quarter of 2011 with 10 percent of the total VC investment -- $831 million -- to Boston's 9 percent share from $710 million invested. This data is according to CB Insights, a venture capital database service in New York. Tumblr. This social blogging platform raised $85 million in September 2011. An investment group led by Greylock Partners and Insight Venture Partners valued the revenue-less company at $800 million. Behind the fever to invest in Tumblr is spectacular growth. In the year ending September 2011, the company saw 131 percent annual growth to more than 30 million blogs that use Tumblr and a 550 percent annual increase in Tumblr's monthly page views to 13 billion. ZocDoc. This start-up lets consumers book doctor and dentist appointments for free and charges the service providers $250 for each. Goldman Sachs invested $25 million Yuri Milner of DST Global added $50 million more -- bringing its Series C total investment to $75 million. With 700,000 monthly users, ZocDoc is valued at $700 million and is using the money to expand -- it launched in Boston in September. Buddy Media. Ford Motor Company, Hanes, ESPN, Hearst Corporation and Virgin Mobile USA use Buddy Media's software as a service to track their advertising campaigns on Facebook and Twitter. In August 2011, an investor group led by GGV Capital invested $54 million in a Series D funding round. Buddy Media's revenues doubled in the last year -- its CEO told TechCrunch -- to an estimated $40 million. Though these companies will likely pay dividends to their investors one day, perhaps a profit motive isn't the only explanation for New York's rise. As I explained in my ninth book, Capital Rising, co-authored with Srini Rangan, capital flows to a region based on its entrepreneurial ecosystem -- that is, its corporate governance, financial markets, human capital and intellectual property protection. Since corporate governance and IP protection are the same across the U.S., the big differences between different regions within the country are due to financial markets and human capital. And as the three deals detailed above aligned capital from VCs around the U.S., the factor that really differentiates New York is its human capital. Talent comes to New York for its global leadership in finance and media. And since both of those industries are aggressively firing employees, the displaced talent needs work. And enough of them have become successful entrepreneurs to propel more New Yorkers to start up. And if those VCs get their hoped-for return on investment, they'll surely look to reinvest part of the proceeds in a fresh batch of fast growing startups in New York. 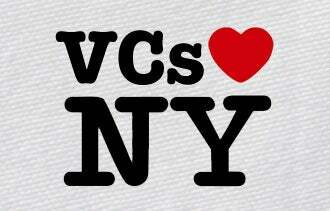 Why do you think New York's startup scene is attracting so much capital these days? Leave a comment and let us know.